Posted in: Homes, Lansing History, People. Tagged: Frederick George Trostle, John B. Voiselle, Joseph Roman Larose, Trostel. I came across an image of 729 W. Allegan while examining images of the house at 735 W. Allegan. In 1981, David Caterino took a series of photographs of structures west of the Capitol that were slated for demolition.The property at 729 W. Allegan was not part of Caterino’s survey, the home was acquired by the state in 1970 and torn down either in 1970 or 1971.A survey of the Lansing City Directories points to the home being built between the years 1884-1887, the 1888 Lansing City Directorylisted 719 W. Allegan as being owned by Joseph R Larose. Just who the architect of the home was is unknown. But one key to who the architect was were the teardrop columns on the second-floor porch an element not seen in the design of many homes. Note how these columns seem almost suspended over their base and how second-floor porch flairs outward. An enlargement of the first photograph that show the teardrop columns on the second-floor porch as well as the columns on the entrance porch and the columns that frame the second-floor front window. The home at 729 W. Allegan was an exquisite structure that contained many interesting architectural elements. Observe the front porch columns in the Doric pier style, a characteristic that is repeated on the shed porch at the rear of the home. The front porch is also canted, laid out at an angle from the main structure. The second-floor window on the front of the home is framed by Ionic style columns, they are so delicate that they could be overlooked. The architect used three styles of columns in the design of the home. It is interesting to note the graceful arching of the roof of the second-floor porch and the attractive slope of the dormer over the second-floor window. These elements coupled with the angler structure of the entrance porch, demonstrated that the architect was comfortable mixing angles and curves in their design. Note the bay window at the back of the home and the fish scale siding on the gable ends. Joseph Roman Larose was born on May 22, 1850 to Francis Xavier and Leonore (née De Lisle) Larose in the state of New York. Joseph spent part of his childhood in Milwaukee but received his education in Quebec. He was apprenticed as a painter and left Quebec for Troy, New York where he worked for several years. His career as a painter meant that Joseph led a life of travel, he found work in Savannah, Georgia and later Detroit. In 1876 Joseph married Miss Melvina [Malvina] Robarge in Detroit, the couple had three children; Mary Maud, Ervy [Irving] Emerson and Edith Rose Larose. Joseph moved to Lansing in December 1877 to labor with John B. Voiselle on the fresco work at the state Capitol. John was a native of Quebec, so in a way John and Joseph had a common background. In 1879 John and Joseph formed the decorating and frescoers company of Voiselle & Larose. Besides painting and tile work the firm sold wallpaper, blinds, moldings and supplied business signs. Years later Joseph started his own business, J.R. Larose & Company a painting and decorating firm. On September 23, 1909, Joseph died of cancer after a year and half battle against the disease, he was 59. Normally I do not explore the home after the first owner, but in this case, I made an exception. The second owner of the home was Anna Trostle (sometimes listed as Trostel or Trussel) who acquired the property in 1891. Anna was the wife of Frederick George Trostle, an early settler of Lansing who was one of the few gunsmiths in Lansing. Frederick was born in Germany in 1840-1841 He married Anna Gilbert, the couple had three children, Mattie M., Mamie E., and George F. Trostle. What is interesting about Frederick is that he disappeared. In 1891 Frederick was brought before the Honorable George W. Bristol, Judge for the Probate for Ingham County and the state of Michigan, by Lawrence Price of Lansing to show that Frederick Trostle was insane. The petition asked that Frederick be committed to the Michigan Asylum at Kalamazoo asa private patient. 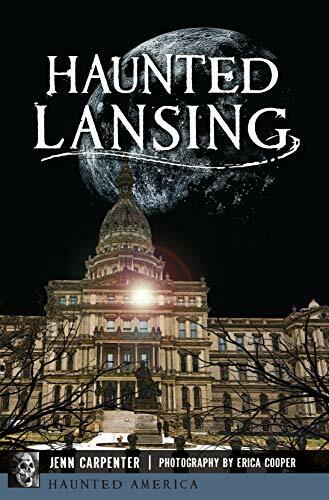 Doctor Joseph Bowdish Hull, who had practiced in Lansing since 1851, testified on October 20, 1891 that Frederick claimed to be the Son of the Supreme Being and his insanity was related to religious subjects. Next, Doctor Alexander McMillen stated that Frederick was insane on all religious subjects and claimed to be the son of the Supreme Being, but on all other subjects he was rational. Doctor D.M. Nottingham testimony agreed with that of Doctor McMillen and reiterated that Frederick was sane regarding all matters outside those of a religious nature. TheDetroit Free Presson November 1, 1892 stated that Frederick ascended the pulpit at Lansing’s Central Methodist Church, on October 30, 1892 and declared himself to be the savior. He was led away by the pastor. The article indicated that Frederick was committed several times but always managed to escape. Frederick was again confined to the Michigan Asylum at Kalamazoo on January 17, 1893, that same year he walked away from the asylum never to be seen again. A death certificate was issued years later with no date. At this time, it is unknown what happened to Frederick. He could have wandered the county as a vagabond and died as an unknown person somewhere in the United States. Part of me wants to think he was happy wandering. Anna Trostle remained in Lansing, passing away at the home of her daughter, Mrs. Mary E. Kuhns on June 7, 1921. If you want to view the images of 735 W. Allegan visit Local History Online, check the Items with Images Only box and enter, with quotes “735 West Allegan”. See LJ9/23/1909 and Portrait and biographical album of Ingham and Livingston counties295. Posted in: Architect, Lansing History. Tagged: Abigail C. Rogers, Albert Jordan, Delia Rogers, James Anderson, Michigan Female College. The Michigan Female College was designed by Detroit architects, Albert Jordan and James Anderson, but just what style of building they designed for the Roger’s sisters is bit of a mystery. Did the building have one wing, two wings or just the central structure? Did an unknown architect design the north wing which was but several years later or was it Jordan & Anderson that designed the addition? 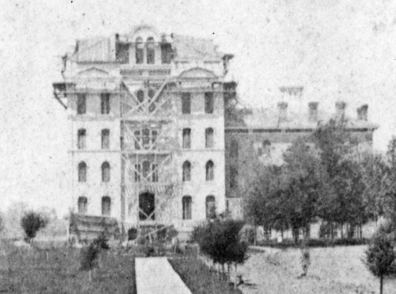 In the above photograph from 1866, you can see that the structure only consisted of a main building, there were no dormitory wings. There is a description of the building from 1873 that mentions the presences of a north wing. Note the central copula and the position of the chimneys. 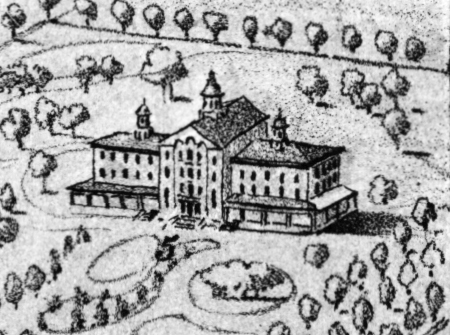 In the architectural drawing below, from the 1859 map of Ingham County, you can observe that the college had a central structure with two wings. That rendering was done by the architectural firm of Jordan & Anderson. Did the below drawing represent the sister’s planned vision for the college or Jordan & Anderson’s? 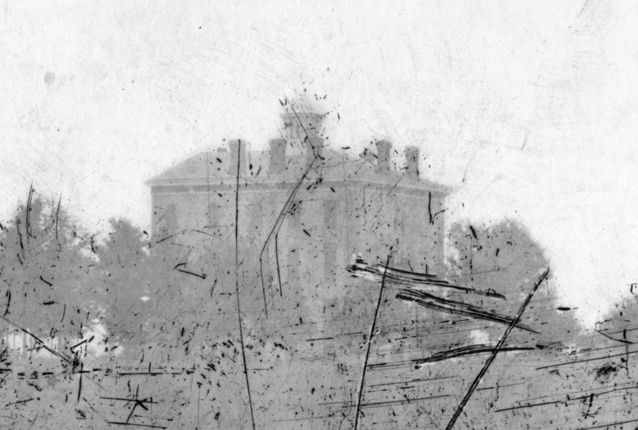 Note that in the 1866 image the building has a hip roof with a flat deck, while the 1873 drawing had tradition slant roof. This image is from the 1866 Bird’s Eye View map of Lansing, note how it resembles the 1859 image presented below. 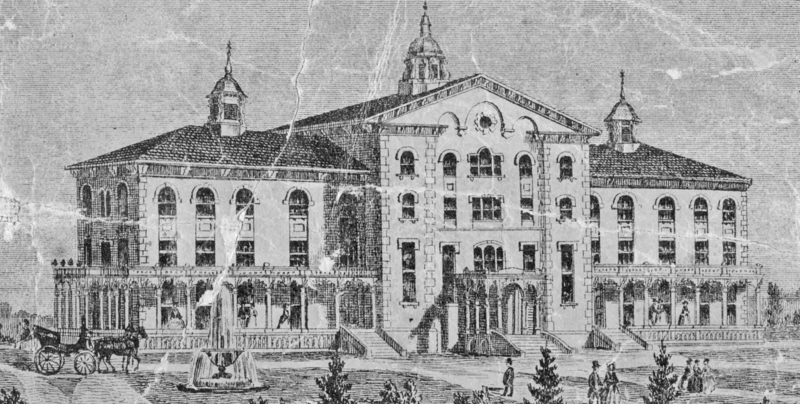 The Michigan Female College, from the 1859 Map of Ingham County. A drawing by the architects Jordan & Anderson. Note the copulas but the lack of chimneys. After the death of Abigail C. Rogers in 1868, her sister Miss Delia Rogers, decided to close the Michigan Female College. Given that the Michigan Agricultural College and the University of Michigan had begun to admit women in 1870 it was a wise business decision. The International Order of the Oddfellows’ purchased the building and property that once served as the college in August 1871 at a cost of $40,000. (DFP8/17/1871 and SR8/19/1871) The Oddfellows’ began a remodeling of the building in 1872 and a short description follows. 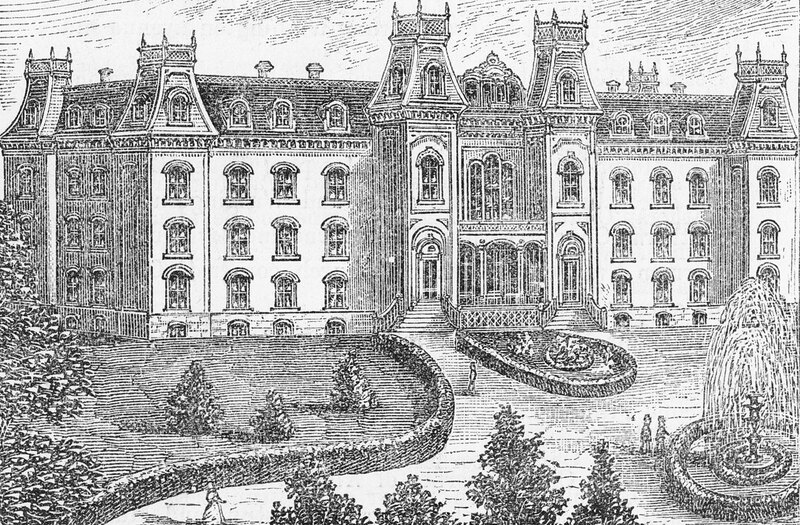 “The edifice, in outline cruciform, filled in at the intersections, is to be of the French style of architecture, its Mansard roof rising ten feet above the cornice which crowns the main brick wall; with four main and four wing towers, the former extending 80 feet, the latter 60 feet, above the basement walls and forming part of the outer walls of the building.” The description is from the State RepublicanAugust 3, 1872, based upon an account provided by Colonel E.M. Fitch that appeared in the August issue of the Odd Fellows’ Companion with a drawing. A woodcut of the Odd Fellows’ Institute from 1873. Unfortunately, the above rendering never happened. Only the north wing and central core was modified in the Second Empire style and it did not have a double entrance. FromLansing, the Capital of Michigan, 1873. The renovations to the Michigan Female College building for the Odd Fellows’ Society were carried out by Saginaw architect, John B. Dibble. Since the college building consisted of a central structure and a north wing, those were the only structures that were altered in the Second Empire Style. The south wing and the separate front entrances were not built at this time. The striking feature in the above design was the entrance porch. The double entryway with its wonderful decorative gable and the three Victorian gothic chapel style windows on the second floor over a recessed porch. The iron cresting on the mansard towers is a bit exaggerated and curious because it seems to overwhelm the towers. There was quite a bit of resentment from the rank and file of International Order of the Odd Fellows’ (I.O.O.F.) in Michigan to the extortion tactics, their words not mine, of the state I.O.O.F. office in their attempt to raise money for the completion of the home and educational institute. (Alpena Argus12/30/1874) The remodeling of the building was not completed until late 1875 or early 1876. The vision of the state office of the I.O.O.F. was not shared by the members of the organization and the building was offered for sale in June 1878. The advertisement in the Detroit Free Pressstated that the “building on the property consists of a main front and wing. The main front is 57 feet square and four stories high, including basement, the wing is 40×50 and four stories high, including the basement” (DFP6/16/1878). If you are interested in learning more about the Michigan Female College and the I.O.O.F. hall click on the links below.